Constituents often fail to hold their representatives accountable for federal spending decisions--even though those very choices have a pervasive influence on American life. Why does this happen? Breaking new ground in the study of representation, The Impression of Influence demonstrates how legislators skillfully inform constituents with strategic communication and how this facilitates or undermines accountability. 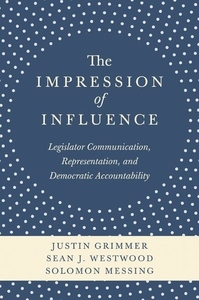 Using a massive collection of Congressional texts and innovative experiments and methods, the book shows how legislators create an impression of influence through credit claiming messages. Anticipating constituents' reactions, legislators claim credit for programs that elicit a positive response, making constituents believe their legislator is effectively representing their district. This spurs legislators to create and defend projects popular with their constituents. Yet legislators claim credit for much more--they announce projects long before they begin, deceptively imply they deserve credit for expenditures they had little role in securing, and boast about minuscule projects. Unfortunately, legislators get away with seeking credit broadly because constituents evaluate the actions that are reported, rather than the size of the expenditures. The Impression of Influence raises critical questions about how citizens hold their political representatives accountable and when deception is allowable in a democracy.